Oreck Magnesium RS LW1500RS Upright Vacuum. At 7.7 lbs., The Oreck Magnesium is Oreck’s lightest full powered upright vacuum. The Magnesium has two-speeds using the Wireless Two-speed QuickSwitch® in the handle. At high speed, this vacuum has high airflow and a powerful, pile-lifting roller brush for cleaning carpets. On low speed, it is gentle enough to clean Oriental, Persian rugs and bare floors. The Magnesium has a low profile design which allows it to lay virtually flat, making it great for vacuuming under furniture without damage. The side brushes are great for gathering up pet hair and dirt, especially around baseboards or furniture. It has a long 30 foot power cord so you don’t have to switch outlets often. The Oreck Magnesium LW1500RS is durable and built to last; and comes with a 7-year limited warranty. This model has received the Carpet and Rug Institute Seal of Approval and meets the highest performance standards. Its large wheels give the Magnesium RS the ability to travel over any surface, from hardwood and tile to plush, frieze, and even soft carpeting. The Oreck magnesium vacuums are some of the most recommended by soft carpet manufacturers such as Mohawk, for hard to vacuum soft carpet brands such as SmartStrand Silk, Caress®, Karastan, and Soft Spring. The Oreck Magnesium LW1500 with Swivel steering easily maneuvers around furniture. Oreck Magnesium LW1500RS Features: The SlimSwivel™ Design gives you Swivel steering to effortlessly maneuver around furniture. The Magnesium™ uses disposable HEPA bags for cleaner air as you vacuum. As air passes through the HEPA inner bag it captures at least 99.97% of particles at .3 microns from that air. This includes dirt, dust, allergens, dander, smoke and pollen. What goes in the bag stays in the bag. Saniseal bag-docking system makes changing the bag a easy. A Magnetic Jam Sensor will automatically shut off the brushroll, if it detects a jam (vacuuming up a sock). Lightweight design makes it easy to carry up and down the stairs and easy to push. Comfort-fit handle has earned the Arthritis Foundation’s Seal of Approval. Twin LED headlights light dark corners and under furniture. Smart-Review Commentary: The Oreck Magnesium LW1500RS is one of Oreck’s lightest vacuums with full power. Because of its sleek design, the vacuum can be laid flat for vacuuming under furniture. Side brushes help to clean baseboards and get close to walls. The Swivel steering allows you to maneuver around furniture easily. To keep your air clean, the Oreck HEPA inner bag helps to clean the air that is expelled from the vacuum as you use it, removing 99.97% of particles. The Saniseal dust bags snap into place for a sure lock, and seal the dirt in when you remove them. They also seal in pet odor. The Oreck RS has LED headlights to light your path so you find dust and dirt, and can see objects on the rug. A magnetic sensor, stops the brushroll when it detects a jam. Transitions from carpets to bare floors effortlessly (no height adjustment necessary). This is an excellent lightweight vacuum, if you don’t need an extension hose built-in to your upright. Oreck RS has a generous 7 year warranty, and you get up to 5 annual tuneups. The Oreck Magnesium RS LW1500 is one of the most recommended vacuums by manufacturers of hard to vacuum soft carpeting, like Mohawk SmartStrand Silk. The floating head design prevents the vacuum from digging into the carpet when force is applied. The over-sized wheels in the back, helps with high pile & plush carpeting. This model has received excellent consumer reviews and is a Smart-Review top pick in the bagged upright vacuum category. Description: At 7.7 lbs., the Oreck Magnesium LW1500RS is the lightest upright vacuum we cover. 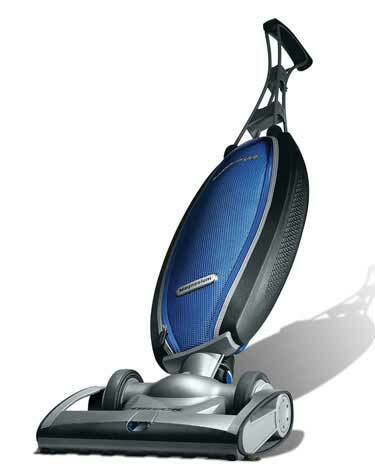 The LW1500RS has large wheels, and is ideal for using on plush and soft carpeting. It can fold flat to get under furniture. 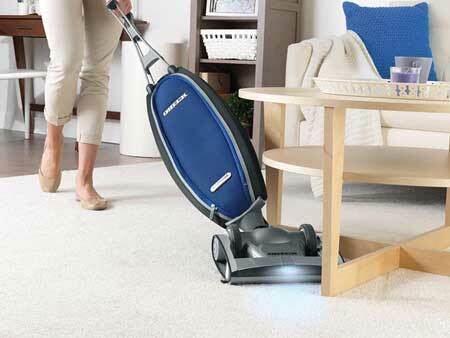 The swivel steering feature allows the vacuum to easily maneuver around furniture. Two power speeds available and a 30 foot cord. The Oreck Magnesium LW1500 is a SmartReview.com Top Pick.